Interesting question. Now that we know that the Salvation of Jews does not depend on faith in the Second Person of the Most Holy Trinity, we can dare to ask the question: 'Can a Catholic be righteous in the Sight of God?' I look forward to the next Pontifical Commission for Religious Relations with the Jews document to fill us in. Apparently, according to at least one Jewish sect - and a powerful one at that - Chabad Lubavitch, the answer is yes, which for us Catholics - though we are known only as Gentiles, will come as a great relief. Apparently, you can be righteous in God's sight, as long as you follow the Noahide Laws, as one Italian Catholic, who enquired to the organisation about becoming a Jew, discovered. 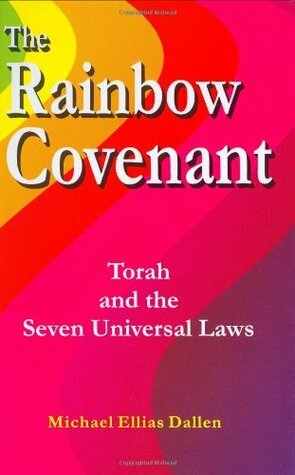 Of course, some 'rigid', 'fundamentalist' types might believe there may be some conflict between being 'righteous' by following the Noahide Laws and proclaiming faith in the Saviour of all mankind, Our Lord Jesus Christ, because a proportion of Jews (it's so unfair to treat them en masse as a block, don't you think?) may well regard faith in Jesus Christ as somewhat idolatrous or blasphemous, but the Pontifical Commission will, I am sure, fill us in on the details and we'll cross that bridge when we come to it. These are just petty details that can be ironed out later on when we are all 'united'. I'm sure that Our Blessed Lord - and St Paul - had much to say on these matters, but we've moved on now and we're not so 'self-enclosed' as we once were. I'll let Rabbi Aaron L. Raskin fill you in for the next two or three hours on how you, as a Gentile, as a Catholic indeed, can be made righteous in God's sight, here, here and here. After all, if the Catholic Faith - if Faith in the the only Begotten Son of the Eternal Father is no longer necessary for Jews to attain Salvation, there's no reason faith in the only Begotten Son of the Eternal Father is necessary for Gentiles either - even Catholics. So let's all just be righteous together and be righteous dudes and dudesses. Then, at last, we will be united and the world will have peace. Quite why the Church is telling Jews they can have Eternal Life without the Divine Faith of Christ is a mystery in itself, because Jews don't seem to believe in Eternal Life nor in the Man Who promises it to those who are faithful to Him. Why does the Vatican want to tell Jews they can have something they don't even believe in or even want? 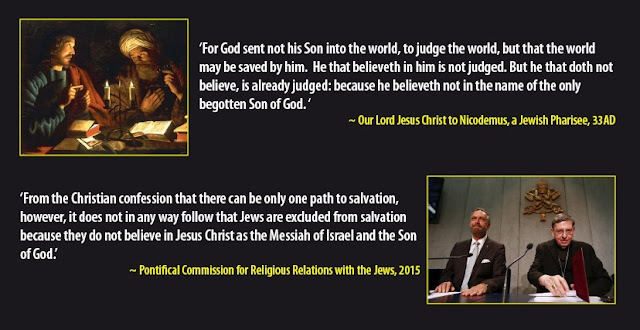 Jews don't believe in Salvation in the sense in which Jesus taught it, if at all. The question is: Do we? Mr. England, this is the best post I´ve ever read on your blog! I would like to ask the following question: Which rabbi has written the latest “Catholic” document on the Jews that was published on Dec 10. by the Vatican? I would bet it was Rabbi Rosen who knows the Catholic faith better than most Catholics but doesn’t´want to convert because he wants to believe what the “Jewish sages” said about Jesus in the Talmud. Eventually he was assisted by Rabbi Koch, oops, I mean by Cardinal Koch. It is a pity that 99,9% of the temporary Catholics don´t understand that the latest document on “Christian-Jewish dialogue” is a Talmudic-Jewish document to the core made to look somewhat Catholic. Again, you speak the truth. Simple, obvious truth which flows necessarily from the Faith, from Revelation. The truth is being banned in more and more places - Lord, have mercy. Hello, Martina Katholik! It's been a long time since I saw a comment from you on English sites. I've missed you. I suggested you to the Remnant to translate the petition to Pope Francis into German. God bless you and your family! I am waiting for Rome to tell us that following Islam as one of the Abrahamic faiths will save us. We can then all convert to Islam, invite ISIS home, adopt Sharia and generally save a lot of bother. Maybe it's less religious than political....in the centuries that Christendom was safe and confident, in the decades that Catholics have mostly been safe from persecution in Protestant countries, the Church was not afraid to seem "different". But now there is a new and deadly threat. Perhaps there is a reaching-out to other denominations and other faiths, and to other political systems, in response to that threat. In the hope of another Charles Martel emerging, perhaps. All heretics, and the Jews who have not accepted Catholicism are heretics, as are protestants etc., etc., are in the same category, Jews are no different from any other heretics. If they are guilty of Objective heresy, fine, there is hope. If of Formal heresy, which is probably not so on the cases cited here, that is a different matter. Reaching out to other faiths means making this clear to them. Since the religion of Rabbinicalism views Catholicism as an heretical Jewish sect, who cares what Raskin thinks. The Novus Ordo, via its revelation of VII and its inclusive worship which includes portions from the Rabbis' siddur - 'work of human hands...' - is trying to remove every element that the Rabbis would consider heretical in order to be good little goys and shiksas by supporting, either directly, or indirectly, the rejection of Christ, the Holy Trinity, and the Precious Blood. PS. The tetragrammaton - the four letter name of God that the Israelites were given is made up of the letter 'yud' = hand; 'heh' = behold; 'vav' = nail; and another 'heh' = behold. Behold the hand, behold the nail. In the very name of God Moses and the Prophets used. You simply cannot comprehend the degeneracy and chaos of liberalism without understanding the role of Talmudic Judaism in the world today. I won't say anymore as the implications of that fact lead us to places many of us are too cowardly to go. Why is the Vatican doing this? Maybe it is simply a matter of anthropocentric survival for Israel has nukes targeting Rome as part of their Samson Option and maybe the Vatican is afraid to anger the insane and malign rulers of Israel who might not take kindly the attempt of Catholics to convert Jews and so Israel might feel it necessary to have the Vatican Blowed-up. I don't know if you allow links on your site, but here is the link to his blog for his post on the jewish-catholic dialogue. I find it "edifying". Talmudic Judaism teaches that Mary was knocked up by a Roman soldier and that Jesus is now boiling in human excrement in hell. Islam is actually more respectful of Christianity in it's teachings. 841 The Church's relationship with the Muslims. Yes the plac of salvation also includes Muslims and Jews and they need to formally enter the Church for salvation, they 'all' need 'faith and baptism' for salvation. So according to Vatican Council II all Muslims need to convert into the Church to avoid the fires of Hell and so do Jews. The Koran reckons the mother of Jesus of Nazareth is the sister of Moses. It also reckons the Holy Trinity is ****. I reckon the Talmud and the Koran are kith and kin...they may not be kissing cousins but the Friday people and the Saturday people are agreed - the Sunday people must become dimmis or dead or convert. That the Friday people and the Saturday people already consider the Sunday people dimmis by default is inarguable. Imagine anyone in the Novus Ordo Institution getting suspended for preaching such a lie? Me neither. "Can a Catholic Be Righteous in the Sight of God?" I know: it's tragic, not comic; but still, we have to laugh in order not to cry, as a Greek proverbial phrase puts it. Circumcision of desire--hahaha! Well if we can have baptism of desire, can I then just have Eucharist of desire. or matrimony of desire, better yet--holy orders of desire?